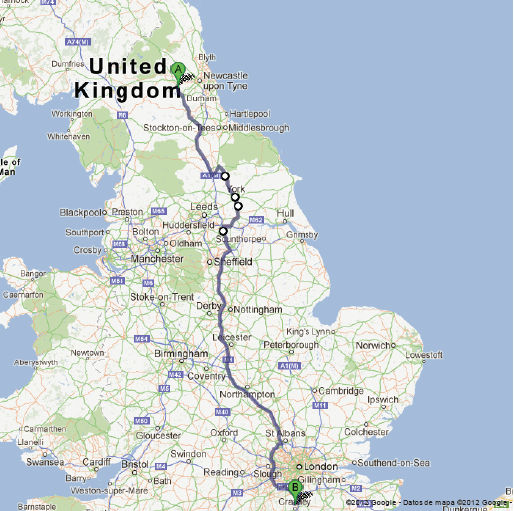 On the 2nd of June I flew in the morning from Toulouse to London Gatwick. At more or less the same time Luca flew from Amsterdam, our friend Elena from Madrid and Maicol drove from Bournemouth, in the South of England. 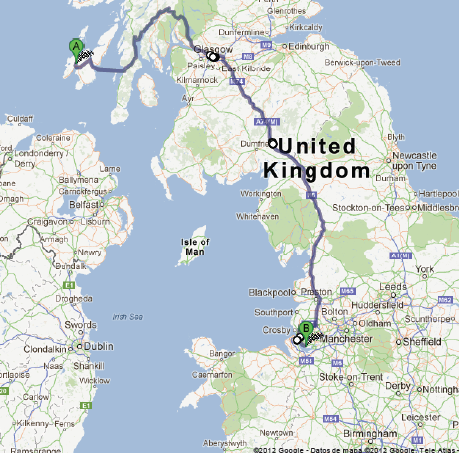 From then on, we embarked into the adventure of seeing as much as possible of Scotland in a week. There we go! 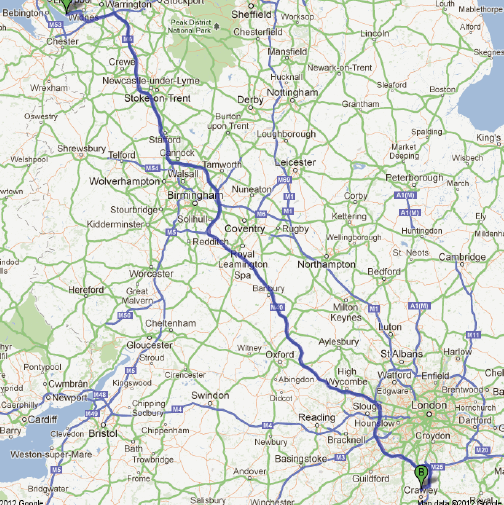 Day 1: Gatwick, York, Riding Mill. At first we encountered heavy traffic in the road, thus we arrived to York later than we wished. We could have a walk around the city. We then followed to Riding Mill where we would sleep at the Low Fotherley Farm, the first of the many Bed & Breakfasts that we would be hosted at. This is a feature which I loved of the trip: those breakfasts! I also enjoyed much the suppers at pubs. 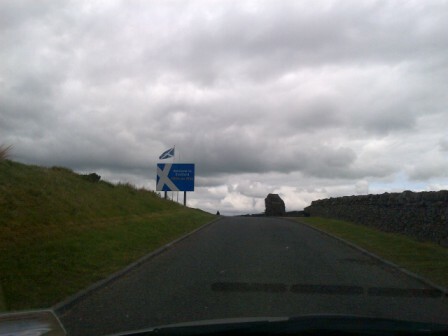 We continued our way to the North, making our first stop at the Scottish Borders, listening for the first time to the pipes and starting to see Scottish flags (St. Andrew’s cross). We then reached Edinburgh and passed it as we wanted to reach Markinch to witness the Highland Games, of which I already wrote one post. We then went to St. Andrews to visit the Old Course, which I explained in a post about golf in Scotland, and back to Edinburgh where we arrived just in time for dinner. 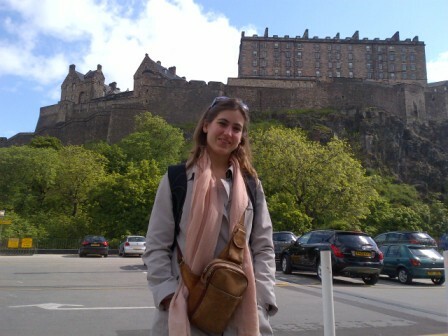 In Edinburgh we slept near Arthur’s Seat, but we decided to skip the trekking to the hill and head to the city centre. We then visited the Castle, where they were getting prepared for the Military Tattoo (where this year an official name for A400M may be given!). In the castle we saw Mons Meg cannon, St. Margaret’s chapel, the Great Hall, the Scottish War Memorial, the One O’Clock Gun firing at 13:00, the Stone of Scone… We then went down to walk along the Royal Mile to see some more highlights of the city, such as the Cathedral or the statue to Adam Smith. We then went to visit the Stirling Castle, but was already closed (as were Glamis Castle and Balmoral, which we also passed by later on in the day). 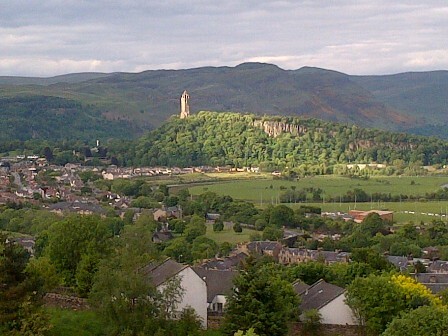 We took a look of the views of the fields around the castle, where many battles central to Scotland’s history were fought, among them those involving William Wallace and Robert the Bruce, who has a statue just at the entrance of the castle. 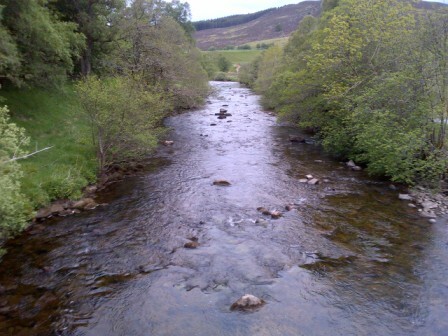 Instead of taking the fastest way by the coast to Aberdeen, we decided to take the route through the national park of the Cairngorms, where the highest mountains of Scotland are. There we saw plenty of deers (we almost bumped onto some of them suddenly crossing the road! ), cows, rabbits, etc. 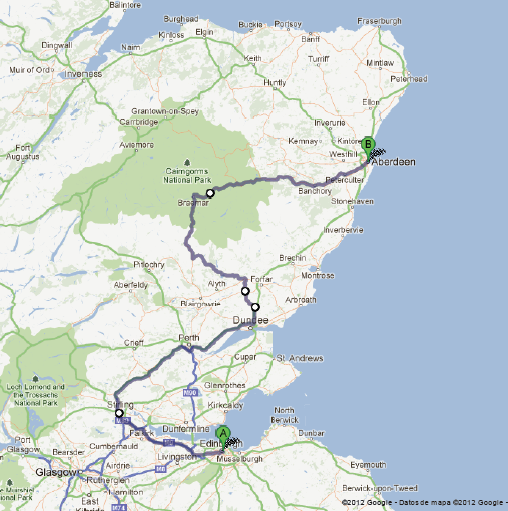 Day 4: Aberdeen, King’s College, Loch Ness, Badbea, Dunnet Head, Thurso. In the morning we took a walk around Aberdeen, the silver or granite city. It was a pity that the cathedral and other places were closed. We could visit the Maritime Museum. We then headed for the beach. We did not take a bath yet, as we were not enough in the North. Close to the beach we saw the football stadium of Aberdeen football club, one of the two which defeated Real Madrid in a Cup winners’ Cup (Recopa) final in one of the four times it took part in the competition. We then went to see King’s College, founded in 1495, with its idyllic campus. 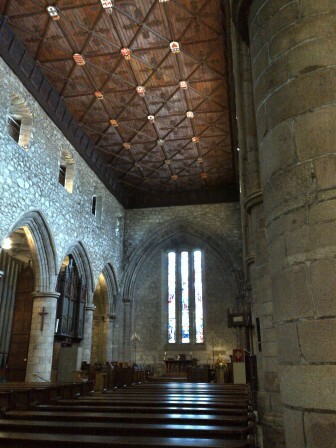 Close to the university we visited St. Marchar’s Cathedral where we enjoyed its heraldic ceiling with the coat of arms of many European kingdoms of the time (including Castile, Leon, Navarra…), and where a quarter of William Wallace is supposed to be buried in the walls. St. Marchar’s Cathedral heraldic ceiling. 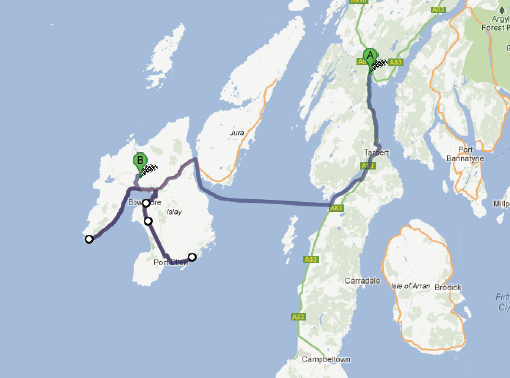 Once we left Aberdeen we went to Inverness and crossed it to see the Loch Ness, and we did found Nessie! 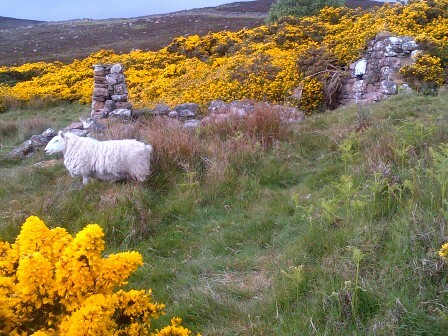 On the way to the north coast we stopped at Badbea, a former village by the cliffs of the east coast established during the Highland Clearances, a dark episode in Scottish history. Badbea (what it’s left of it). We finally reached Thurso, on the north coast, but that was not enough, we needed to reach Dunnet Head, the northernmost point of the island (being this the one and not John o’Groats). There we could see the lighthouse and some fortifications built during WWII. 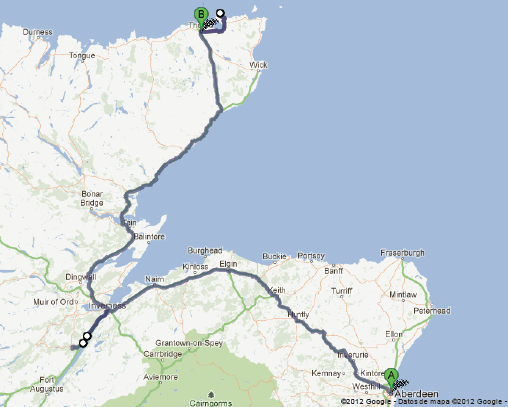 Day 5: Thurso, Bettyhill, Durness, Ullapoll. 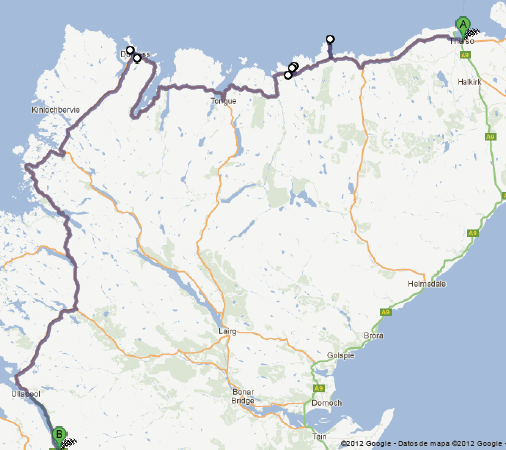 We departed from Thurso and started our tour along the north coast of Scotland, one of the requirements for the trip. 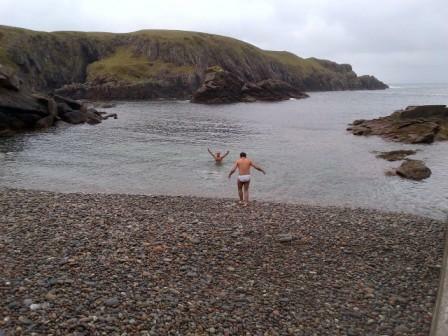 We made some stops along the way, to see some sight spots, to have a swim at the North Sea (close to Bettyhill), to visit the Smoo Cave at Durness, to see Durness’ beach and unexpectedly to play golf at Durness Golf Club, as I already explained in an earlier post. Having a bath at the North Sea. 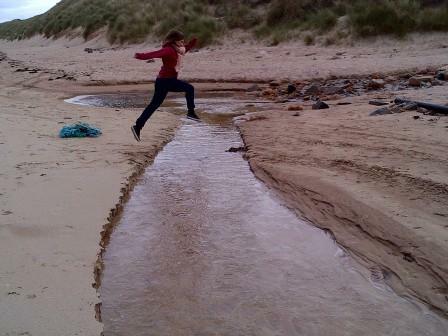 Luca “flying” at Durness beach. 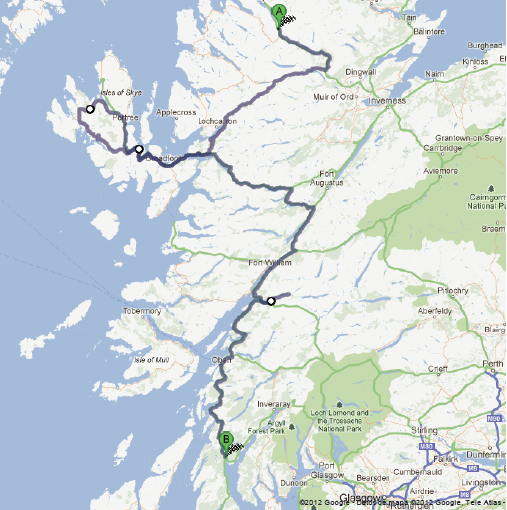 Day 6: Ullapoll, Isle of Skye, Glencoe, Goban. 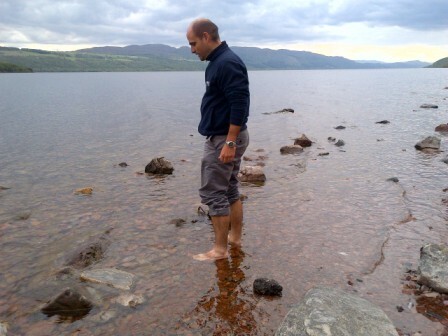 We had been recommended the visit of the Isle of Skye, as the most beautiful of the islands. After almost rounding it completely we do not recommend the visit. We had some lunch at Portree, which we didn’t either find particularly beautiful. Sincerely, we found dozens of more beautiful spots driving down the west coast of Scotland. Continuing with our tour we made two short stops: at Glencoe, to visit the memorial of the massacre, where most of the MacDonald clan was killed, and at Goban, a nice port city. In Islay the main attraction was to visit Bowmore distillery, which I described in an earlier post. We had a walk around the village and then went on to visit the other villages of the island, Port Ellen and Porthaven, where we had some coffee. 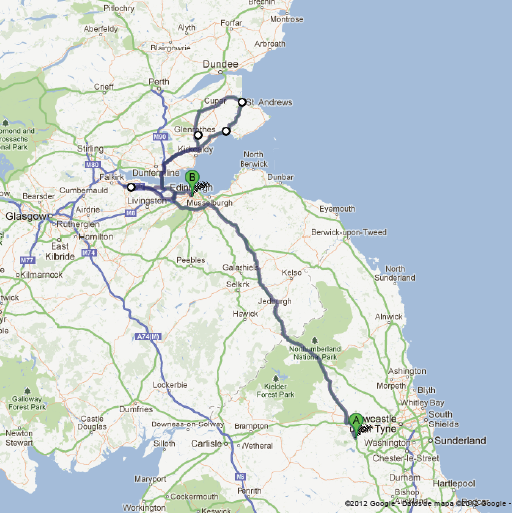 Day 8: Islay, Glasgow, Lockerbie, Liverpool. On the way to Liverpool we stopped to have a walk in Glasgow, where we had lunch at the restaurant “The Willow Tea Room“, designed by Charles Mackintosh in 1904. Later on, as we saw in the road the signpost of Lockerbie we drove by to see if there was any memorial of the tragedy with the Pan Am Flight 103 which exploded on air; we didn’t find it. 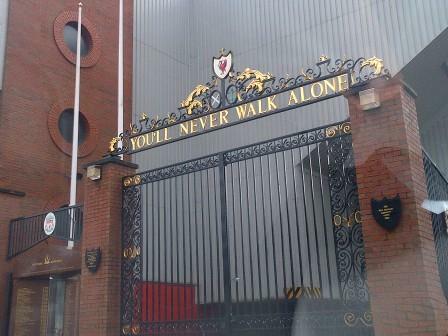 In Liverpool we went by Anfield, though we were late for taking on any guided tour. This is something for which I’ll have to come back. We then moved to the centre to visit The Cavern Club (where The Beatles made their first performance) and have some dinner. 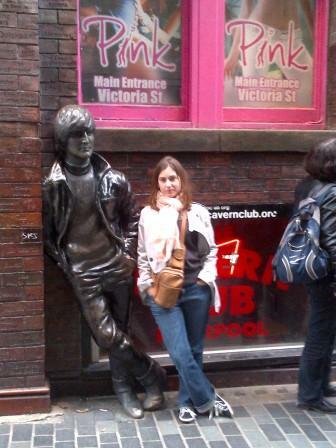 Luca at The Cavern Club. This was the last day of the tour, with the only goal to get to Gatwick in time for our flights. The only remarkable thing we saw were some paratroopers being dropped from a C-130J-30 from the UK Royal Air Force, some miles to the East of Brize Norton air base.